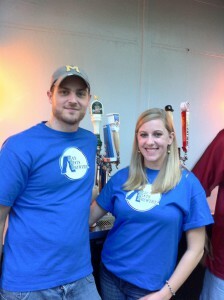 Mike and Allison Spratley are Blue Pants Brewery. Blue Pants released their first beer today at The Nook in Huntsville, Alabama. It is called Knickerbocker Red in the style of a American Red Ale. Knickerbocker Red presents with a sweet nose. There is a little woodiness in the nose as well. The initial taste has a sweetness. The hops are very mellow, but they arrive late in the taste and hold on to the finish. The finish is a little alkaline, too. Blue Pants is the third brewery to open in Huntsville. Initially, Blue Pants will have limited distribution throughout Huntsville. This entry was posted in Breweries, Brews by Brian Allen. Bookmark the permalink.